THE Sri Maha Kaliamman Temple near Kampung Tasek Tambahan in Ampang has been demolished several times in its 19-year existence. Now it will be rebuilt for the third time -- once the Selangor government provides a new location. Scores of non-Muslim places of worship have faced a similar fate, but with this issue swaying voters in the March 8 general election, both Barisan Nasional and Pakatan Rakyat members are speaking up for them. In the mid-1990s, then prime minister Tun Dr Mahathir Mohamad ordered that the demolition of places of worship had to be approved by the respective menteri besar or chief minister, while he himself would decide on cases within the Federal Territory. But over the years, this directive has been ignored or forgotten. Part of the problem is that many of these sites do not have land titles, notes Datuk A. Vaithilingam, president of the Malaysian Consultative Council of Buddhism, Christianity, Hinduism and Sikhism. The Malaysia Hindu Sangam, the country's umbrella body for Hindus, has been working to register an estimated 7,000 temples and 10,000 shrines. So far, they have been able to register only 2,000 because many are suspicious of the exercise. Last year, the Hindu Sangam asked the Housing and Local Government Ministry to conduct the registration instead. In some cases, places of worship are built "illegally" on land belonging to the government or private owners. The Sri Maha Kaliamman Temple, for example, was on Selangor forest reserve land. As far as possible, religious leaders try to negotiate new sites with local authorities or developers before the bulldozers move in. But sometimes, they only find out about demolitions when it is too late. The demolition of the 60-year-old Sri Maha Mariamman temple in Shah Alam on Oct 30 last year, just before Deepavali, may have cost BN the local non-Muslim vote in the polls. When the Ampang Jaya Municipal Council (MPAJ) demolished the Sri Maha Kaliamman Temple last September, both BN and Pakatan leaders protested. MIC Youth chief T. Mohan pointed out that the new Pakatan-run state government had promised not to demolish any places of worship, while Kapar member of parliament S. Manickavasagam threatened to resign as Parti Keadilan Rakyat's Selangor liaison committee deputy chairman if no action was taken against MPAJ officials. Selangor's state committee on non-religious affairs, set up after the elections, temporarily suspended MPAJ deputy president Hamid Hussain and investigated the incident. One of the outcomes was that owners of 27 plots of state land approved for places of worship in Selangor were told they need only pay RM1,000 quit rent for the first year and then a nominal RM1 for the remainder of new 99-year leases. But although authorities are now more open to talks, it will take time for change to take effect. "The government may have changed in some states," says Loka Ng Sai Kai, coordinator of the Malaysian Buddhist Solidarity Group, "but the local government officials are still the same. These officials don't necessarily understand the structural and cultural issues involved." Bar Council's Roger Tan has been calling for a department of non-Muslim affairs to be set up in every state, stressing that religious leaders should be involved in decision-making on issues affecting their communities. "If an illegal non-Muslim place of worship is demolished by a department of non-Muslim affairs, the impact and reaction would not be as great as it might be if the task were performed by the land office or local authority," he says. Religious leaders complain of having faced political and bureaucratic hurdles for years. Vaithilingam says the difficulty of establishing non-Muslim houses of worship leads to "illegal" temples and shophouses being turned into churches. It is not uncommon for a decade to pass between application and approval of a non-Muslim house of worship. The Vihara Samadhi Temple in Shah Alam is a case in point. In the early 1990s, the Buddhist Missionary Society Malaysia (BMSM) submitted a building plan to the Shah Alam municipal council for 1.3 acres bought from the Selangor State Development Corporation. The application was rejected -- after some five years -- on grounds that there was a large Muslim population there. BMSM was compensated with another piece of land nearby, which took the Shah Alam municipal council another three years to approve. Finally, after more than 10 years, the layout plan was approved just before the March general election. Datuk Chee Peck Kiat, BMSM's honorary secretary-general, says impractical restrictions on building dimensions are as much to blame as the bureaucracy that stalls approval. At a meeting with various non-Muslim representatives to discuss new guidelines for non-Muslim places of worship, Pakatan decided that such restrictions should be dealt with "on a case-to-case basis", taking into account the needs of the communities. Another major hurdle is funding. The Federal Government has earmarked RM8 million for building non-Muslim places of worship from 2005 to 2008, with RM428 million allocated for Muslim facilities. 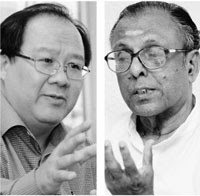 Non-Muslim leaders say the meagre allocations compel them to rely on their own financing. In his Budget 2009 speech last month, Selangor Menteri Besar Tan Sri Abdul Khalid Ibrahim proposed RM6 million for non-Muslim places of worship and RM103.5 million for the state Islamic Religious Department to build, maintain and upgrade religious primary schools, offices and mosques. Religious leaders urge that places of worship not be seen as flashpoints but as nation-building blocks. Such institutions can help promote consciousness of morality and service to others, says Reverend Dr Hermen Shastri, general secretary of the Council of Churches Malaysia. "The religious community is a vital link in this process," he says. "If people want to learn more about their own faith and offer services beyond themselves, the authorities should facilitate them."